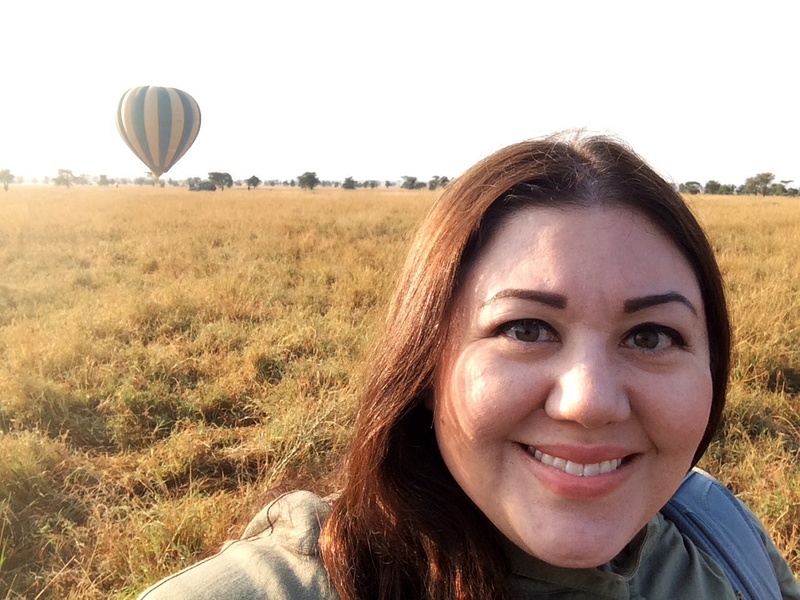 On the morning of July 9th, I had the opportunity to do something I’ve wanted to do for years – go on a hot air balloon ride! I had paid a premium by booking in advance to guarantee a spot on the balloon, as I had been told the balloon rides often sell out. The high price ended up being worth every penny, as this was one of the best experiences of my life! 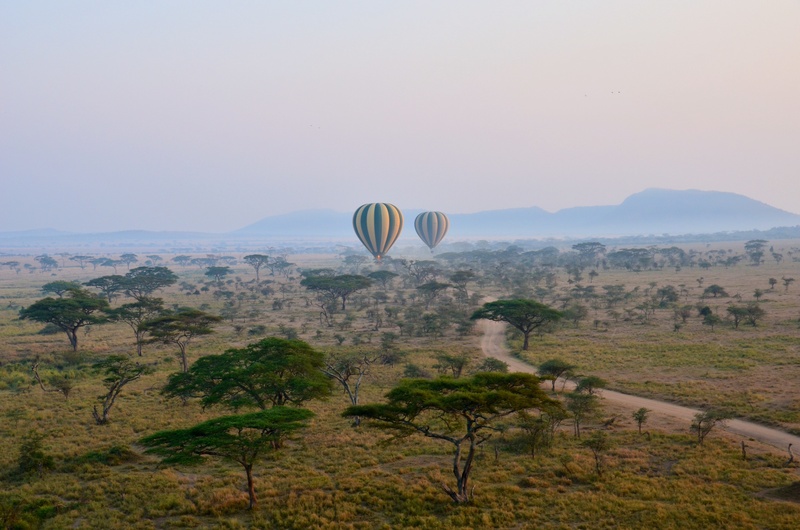 I also found out that the operator of the balloon rides pays a fee to a conservation fund for the Serengeti National Park, which also helped to justify the cost of the ride. 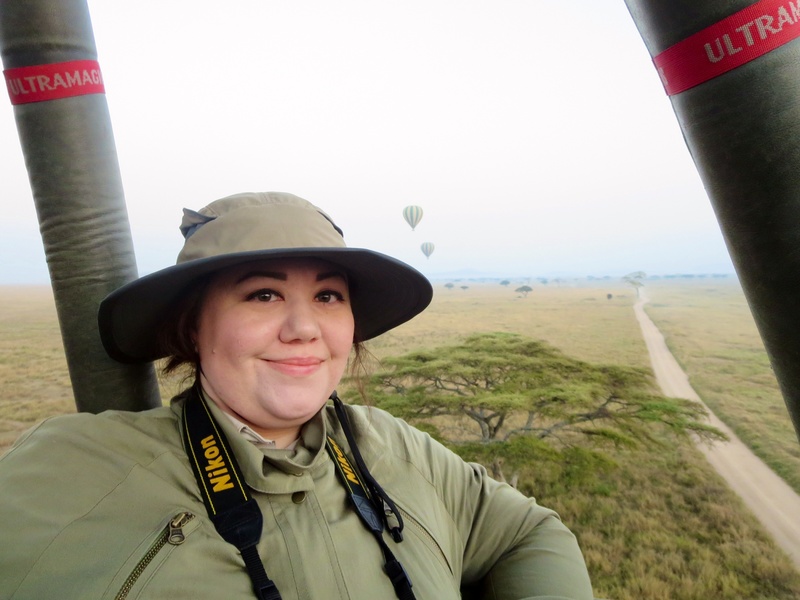 I had known that I was going to have to leave early in the morning, as the itinerary described a “sunrise ballon ride,” but what I didn’t realize was that we would have to leave at 4:30 AM! I was the only person from my travel group who signed up to do the ballon ride. 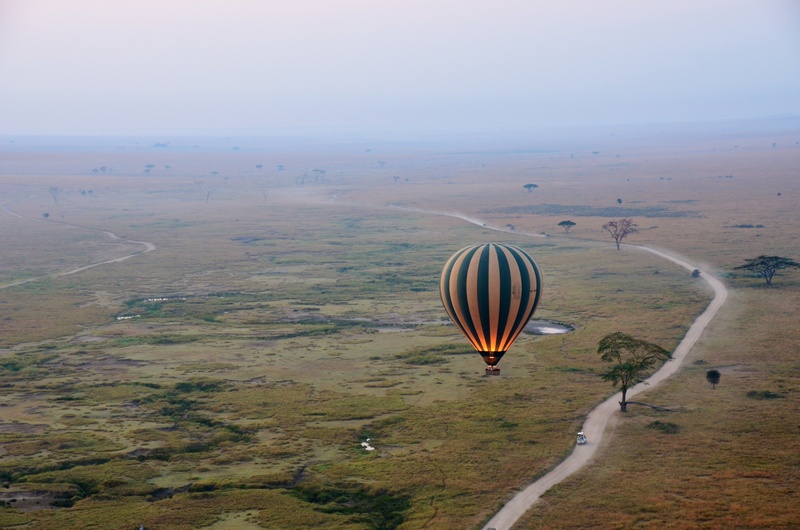 One person in my group had already done a balloon ride over Maasai Mara in Kenya and said that it was “disappointing, especially for the cost,” but I tried not to let this cloud my outlook. 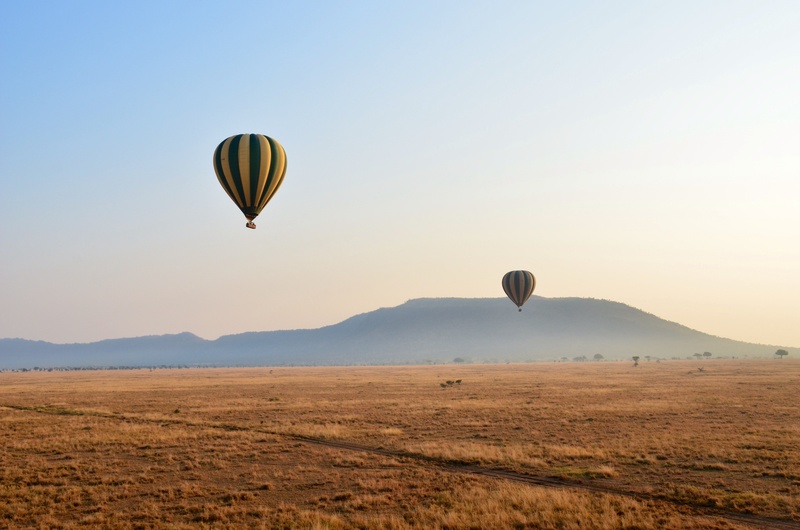 There were four other people staying at my lodge who were also doing the balloon ride – a couple from South Dakota who had just summited Mt Kilimanjaro and a couple of middle-aged guy friends (one from Louisiana and one from Texas) who had just finished a hunting safari. 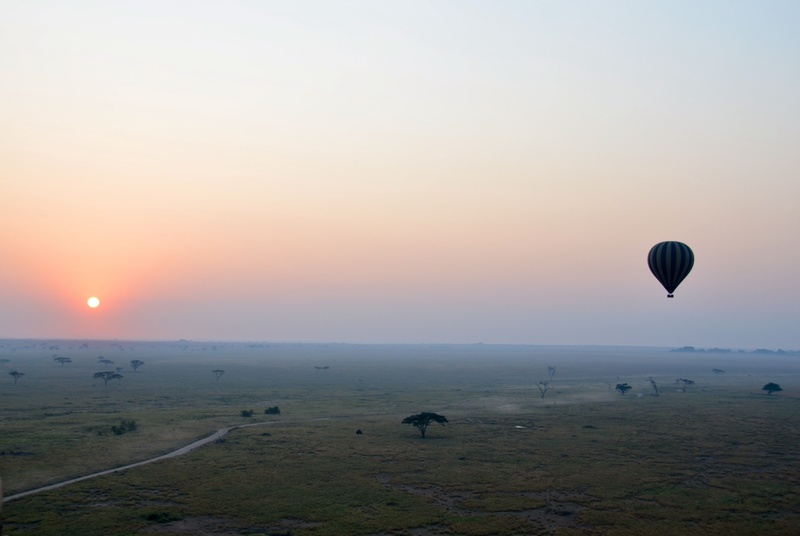 A rep from the balloon company drove us to the launch point for the balloons in the Seronera part of the Serengeti, about an hour’s drive from our lodge. We picked up a lady who was also doing the balloon ride at a semi-permanent campsite along the way. Being that we had an hour-long car ride, we had some time to talk amongst ourselves. I would have been just fine staring out the window like a zombie, as I had not yet consumed any caffeine, but the Southerners (being the friendly people that they are) started up a conversation. The couple from South Dakota had a good time on Mt Kilimanjaro. It took them 6 days to summit and one day to descend. They said there was a big entourage of porters for the people in their group, and that the porters carry heavy loads (55 pounds) on their necks but only make one or two dollars a day. It was sad to hear that they make such little money for such grueling work, but good to hear that everyone tipped them generously. The two Southern guys kept talking about the animals they killed on their hunting trip. They talked about how they ate the animals, how they were having the heads mounted and sent home for decoration, and how they were having a zebra made into a rug. I think we were all a bit disgusted, but we were trying to be polite and just listen at the same time. There was no point in starting an argument with strangers before what was to be a fun event, after all. After we arrived at the launch site, our balloon pilot gave us instructions for getting into the basket and for take-off and landing. 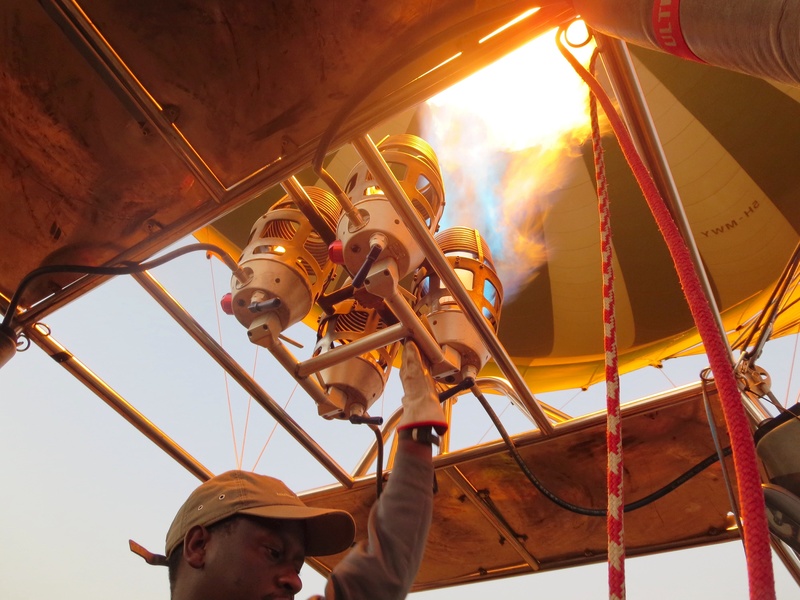 The balloon basket had four compartments on either side of the middle compartment, which was for the pilot and his equipment. Each compartment fit two people, so there were 16 passengers per balloon. Our pilot assigned each of us a compartment. While he was doing so, the guy from Texas started to walk away. The pilot told him to come back, to which he said “No!” Everyone, including the crew inflating the balloons, thought this was hysterical. Apparently this big, Texan hunter was terrified of the take-off. Eventually the pilot was able to convince him to go, and we all proceeded to get in the basket. This was kind of an awkward process. The basket starts on its back, and everyone climbs in and waits for take-off looking up at the sky. Eventually the balloon takes flight, and the basket rights itself so everyone is sitting up straight. Luckily I was in one of the compartments closest to the ground, meaning I didn’t have to climb to one of the top compartments. Supposedly this is easier than climbing in with the basket upright, because apparently the wind can cause the basket to move around making it difficult to jump in. Once we were in the air, we could stand up and move around within our compartments. It was pretty snug with two people in each compartment, so we couldn’t move too much. Our pilot rotated the balloon around several times so that we all had a good viewing experience, which was nice. Our balloon was the third of four balloons to lift off. 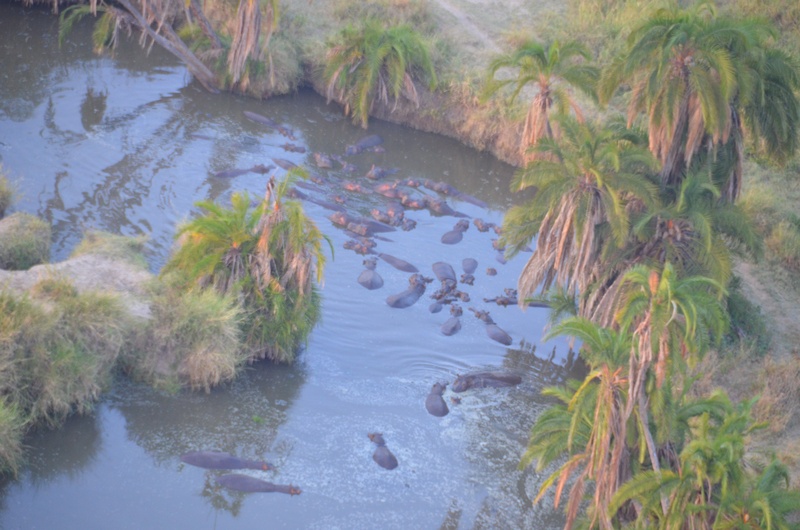 All of the pilots had walkie-talkies and would tell each other when there was an animal spotting so that we would all be able to see it. The balloons were even outfitted with GPS devices, which I was surprised to see. Our pilot was a bit of a comedian. Someone asked him how many balloon rides he does a week, and he told us that this was his first one. 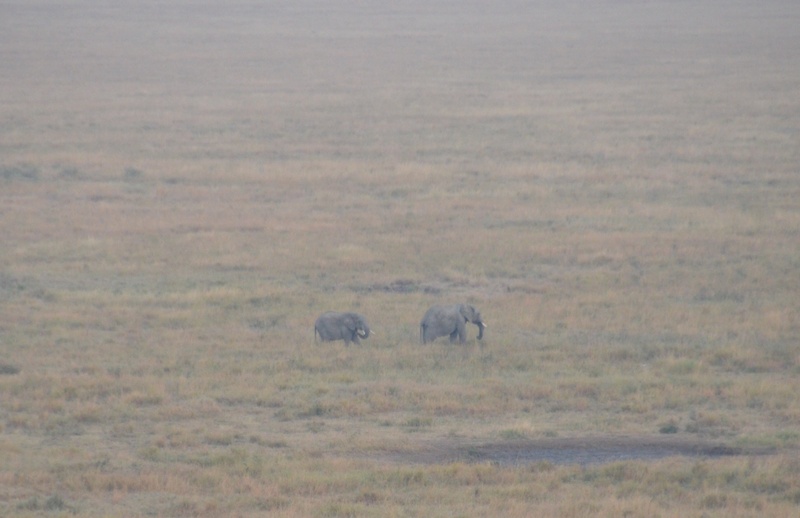 Less than a minute into the ride, we saw some elephants walking along. 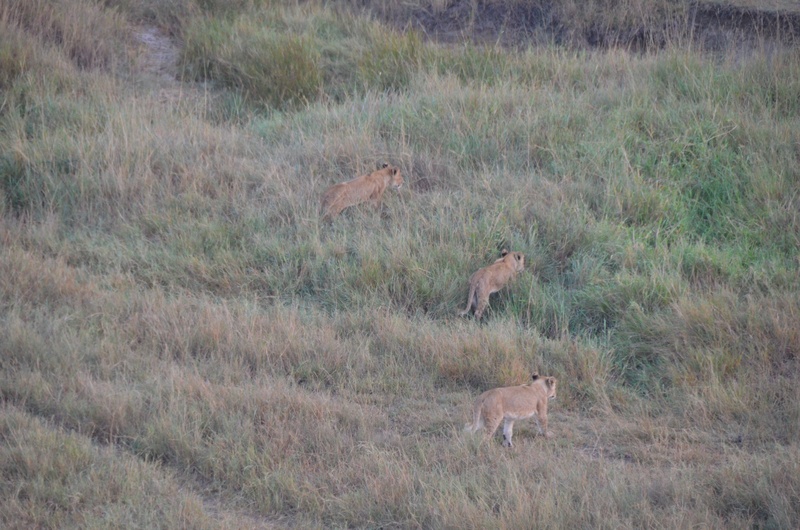 Shortly after that, we saw a pride of lions running across the field! That was an amazing sight to take in, especially from above, since it is somewhat rare to see lions do much beside sleeping. 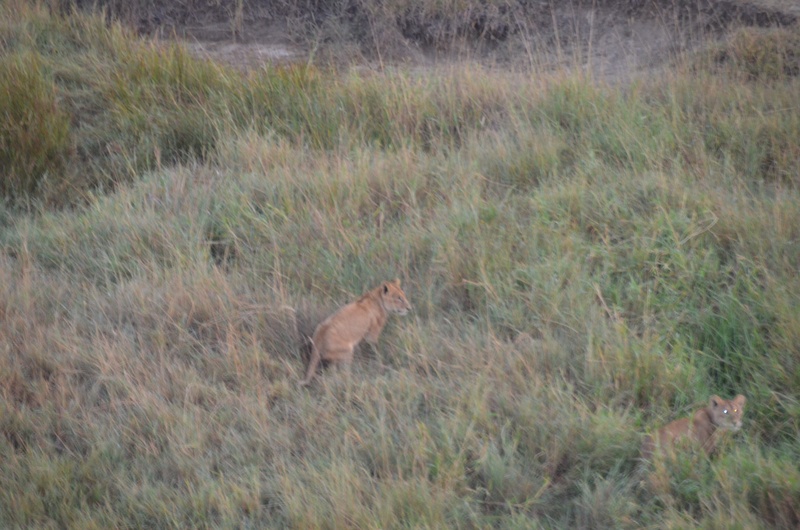 One of the lions stopped as we passed over and stared at our basket. I felt like she was looking right at me! 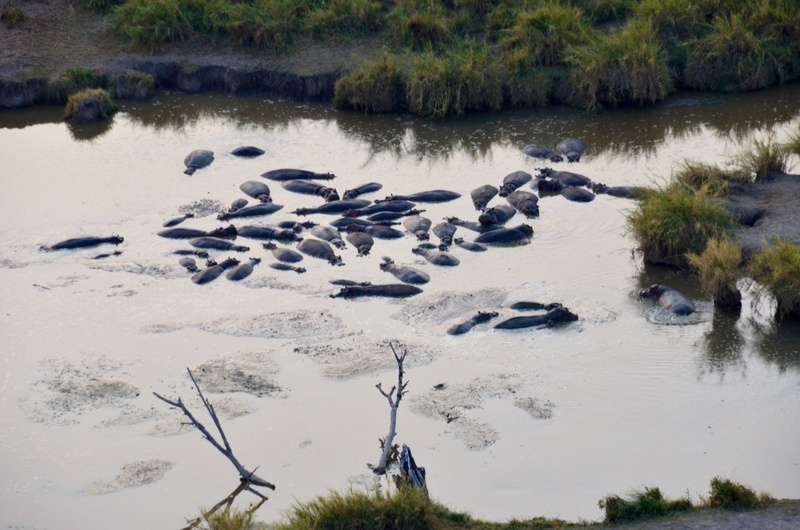 A bit after that, we saw lots of hippos lazing around in the water. 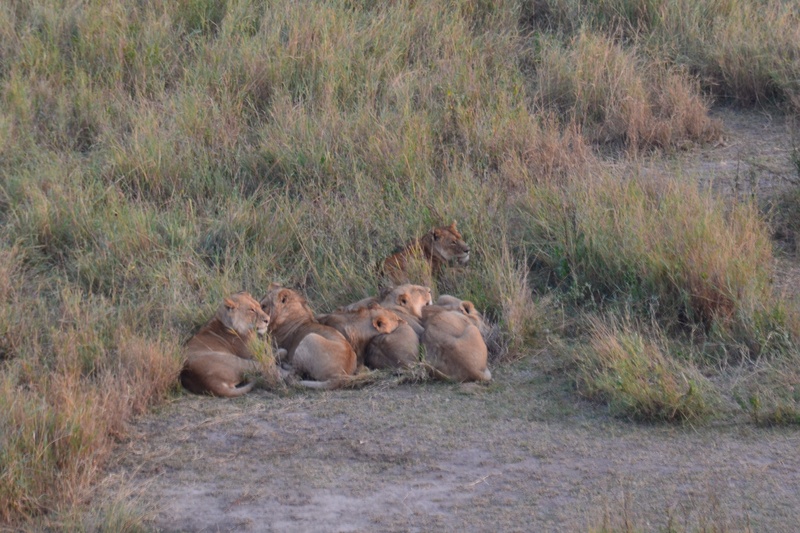 Then we came across another pride of lions all snuggling together in the grass. The ride lasted a little over a hour, during which we also saw a cheetah (I was too slow to take a picture), gazelles, giraffes, hyenas, warthogs, reedbucks, and vultures. 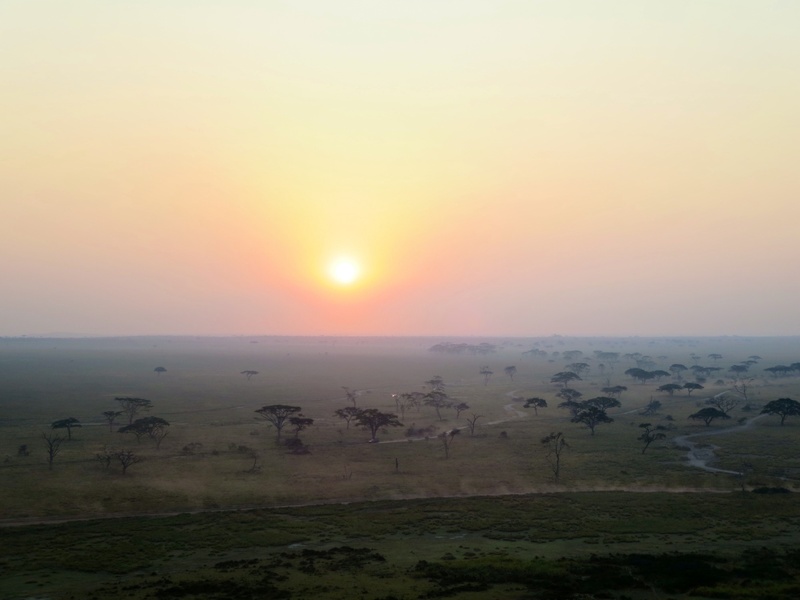 It was truly amazing to get a bird’s eye view of all these animals going about their daily business and to see the sun rise over the Serengeti. It is definitely one of the most memorable experiences of my life! 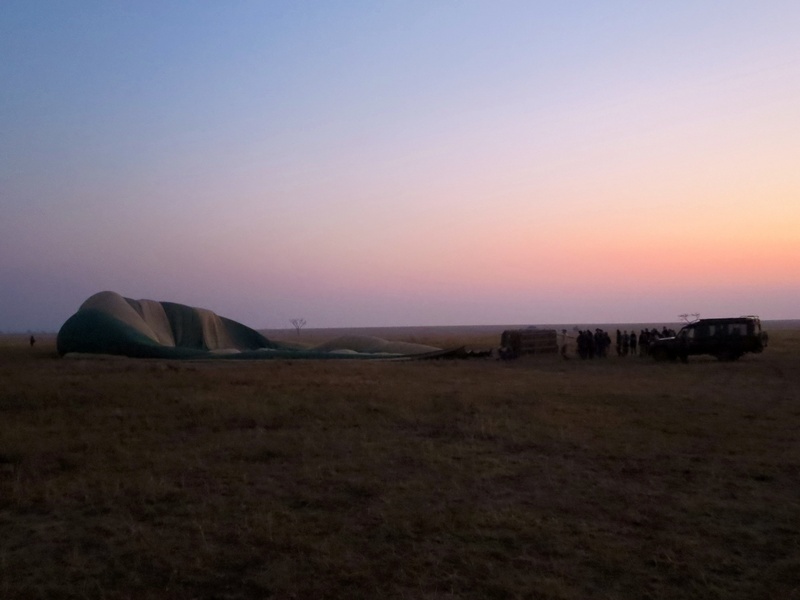 We had a smooth landing and then were driven to another clearing where one of the pilots told us the story of the origin of hot air ballooning, and we had a champagne toast. 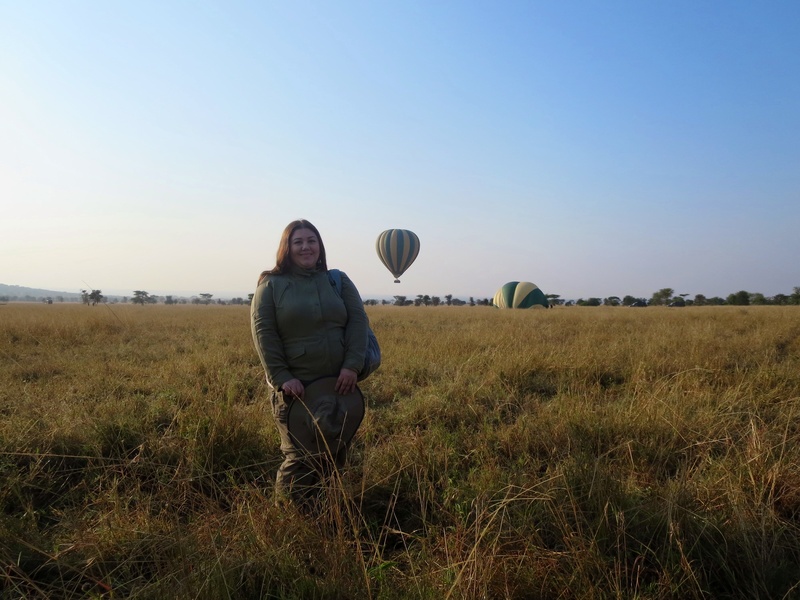 It was a bit surreal standing in the middle of the Serengeti, drinking champagne, when we had just seen 20 lions! 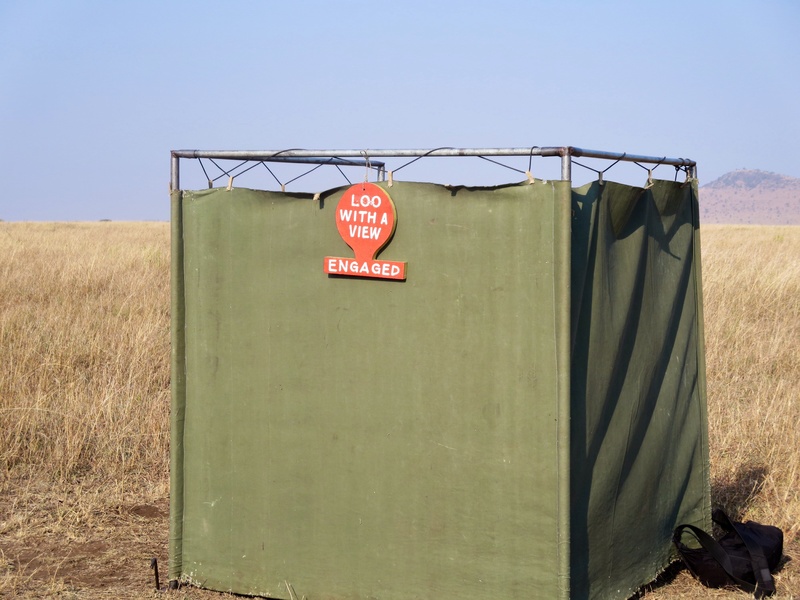 Sure, we couldn’t see any animals from where we were standing, but the thought of being some animal’s breakfast was definitely in the back of my mind! It was interesting learning about the history of hot air ballooning, which I previously knew nothing about. Apparently it started in France in the 18th century by two brothers whose father owned a paper manufacturing company. The brothers were burning some of the paper one day and wondered if flight was possible based on whatever force was lifting the embers from the fire into the air. After successfully giving flight to some experimental balloon devices, they decided to send some animals up in a balloon to test whether living beings could still breathe in the upper atmosphere. Once this step was completed, the brothers made larger balloons and sent people into the air. Supposedly the farmers whose property the balloons landed on were afraid the balloons and their passengers were some kind of ill-intentioned, supernatural force. Because of this, the brothers would give these people bottles of champagne (which, at the time, could only be obtained through the king and were stamped with the royal seal), so as to let everyone know that they were real human beings, not demons or aliens. 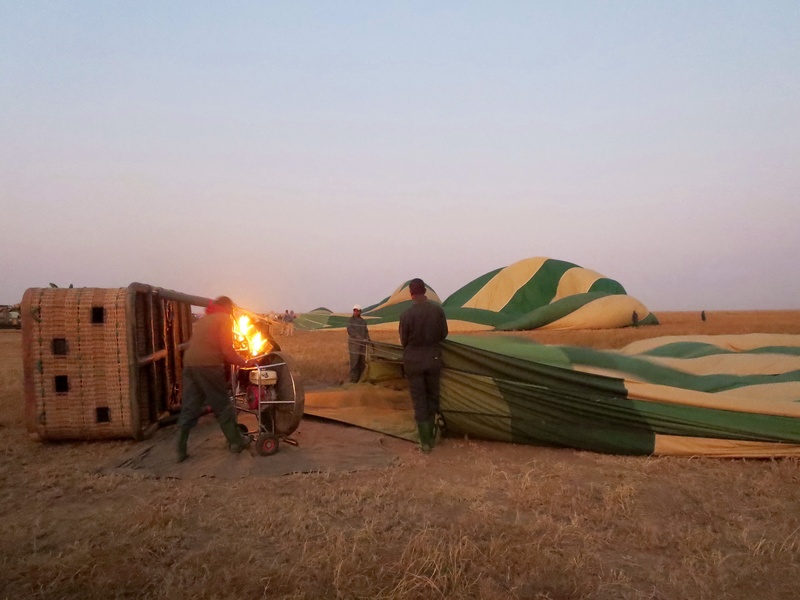 This is why it is a tradition for hot air balloonists to have a champagne toast upon landing. 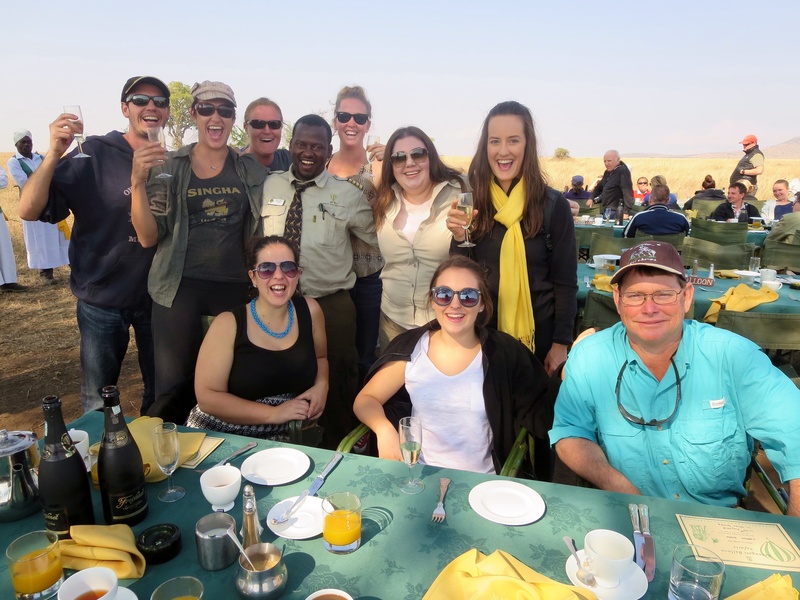 After a couple of glasses of bubbly, we were driven to another clearing in the Serengeti where we were served a full English breakfast. 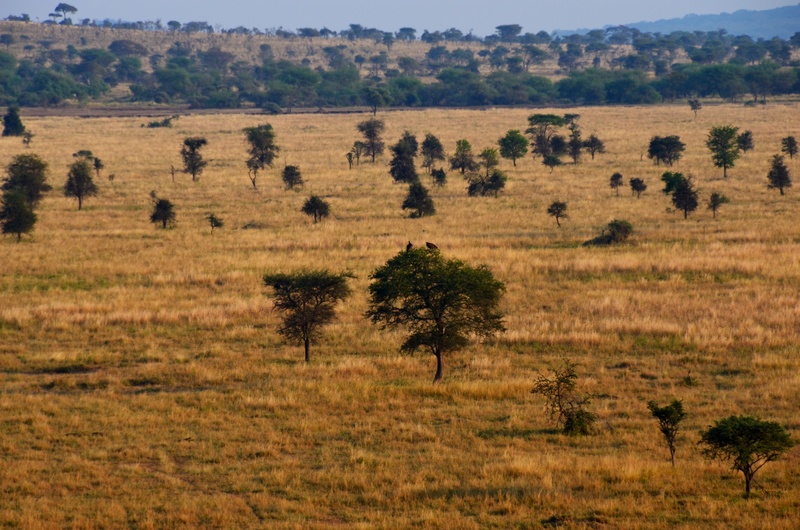 Again, it was surreal to be enjoying a leisurely breakfast in the middle of the Serengeti! I ended up sitting at the end of a table with a group of young Australians who were doing the camping version of my trip. They were a lot of fun to hang out with, perhaps because we were consuming the majority of the champagne! I had about six more glasses before we ran out of champagne. I wasn’t thinking about it at the time, but I was lucky to not feel any adverse effects from all the champagne. I don’t think it would be fun to deal with that while riding around bumpy roads in a hot car for the rest of the day!